The White Tower was built in the fifteenth century after the fall of Thessaloniki to the Ottomans in 1430. The White Tower was built in the fifteenth century after the fall of Thessaloniki to the Ottomans in 1430. At its location there had been an older tower belonging to Thessaloniki’s Byzantine fortifications, where the eastern wall met the sea wall. The Tower was the eastern end of the sea wall; there was another at the western end, and a third in between. Over the years, it was referred to by various names: the Lion Tower in the sixteenth century, the Tower of Kalamaria in the eighteenth, while in the nineteenth century we find it with two names, depending on its use: the Tower of the Janissaries when the garrison of Janissaries was stationed there, and the Tower of Blood (Kanle Kule) when it became a prison and place of execution for convicts. In 1880, in his book on the city’s monuments the historian Mihail Xatzi Ioannou called it the Bastille of Thessaloniki, where those condemned to death were slaughtered on its terrace and their blood dyed its walls red, as a cannon shot from the western part of the city signified that the death sentence had been carried out. In 1883, on orders of the Sultan Abdul Hamid II, the Tower was painted white and given the name “White Tower” (Beyaz Kule). We are in the second half of the nineteenth century, an era when the winds of reform were blowing in the Ottoman Empire in the wake of pressure by England, and the Tower with its “bloody” name was not appropriate to the empire’s new character. It was a convict, Nathan Guiledi, who whitewashed the Tower in exchange for his freedom. It has remained with its current name since then. 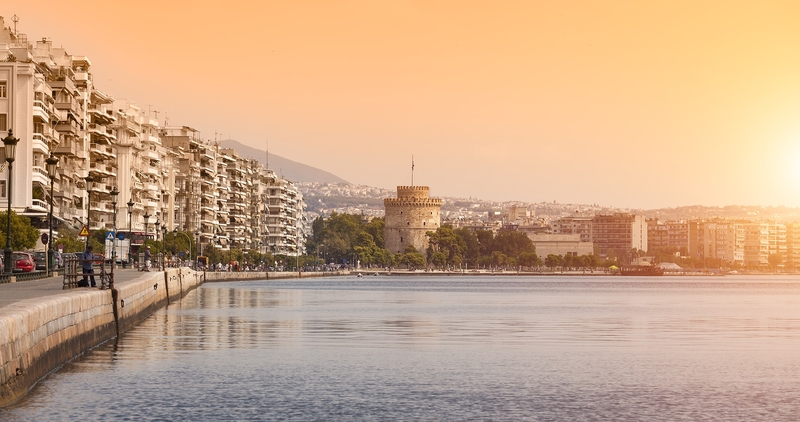 In time it became the symbol of Thessaloniki, since from 1911 it stood by itself on the seacoast following the demolition of the sea and eastern walls and its surrounding wall. After the city’s liberation in 1912 and its incorporation into the Greek state, the Tower had various uses. During World War I, one floor was used to store antiquities from the excavations done by the archaeological service of the Armée d’Orient. The city’s air defense, Aristotle University’s meteorology laboratory, and Sea Scout groups have all been hosted in its spaces. In 1983, the Tower was given to the Ministry of Culture.